We are back with another bookswap! This time, it is in space! At least that is what we would like you to imagine with the theme “Books of Tomorrow, Today!”. 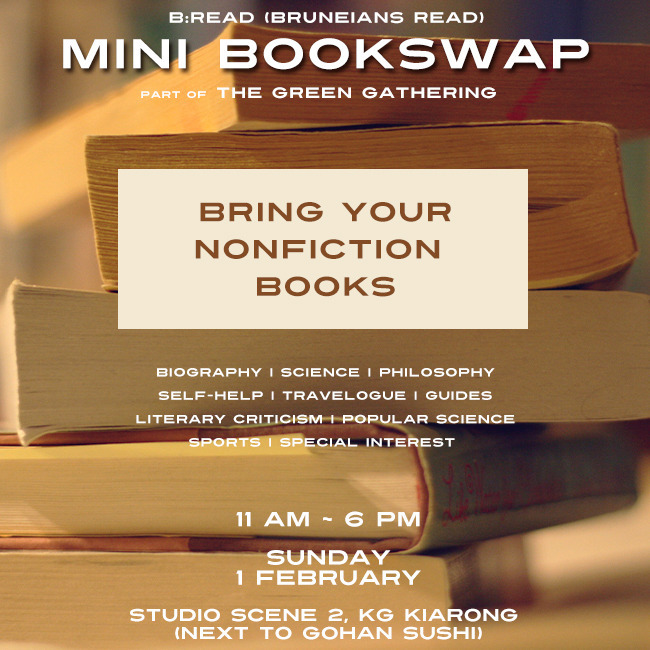 Bring your pre-loved books and swap for new ones at the bookswap! We have a collection of 300 books for you to swap! Meet people, read at the event, bring your family and friends! What is it? : Five words, that is all it takes for stories to unfold. Continue the Story is a writing activity open to everyone where we get everyone to write one story. The catch is you only have five words to add to the story before the next person chips in another five words. Hilarity ensues, drama unfurls, and tears are shed. What is it? : So you think you know about what writers wrote what? If you do (or don’t), then join us for this quiz! The more answers you get right, the more points you get. Gather your points for the quiz and stand a chance to win tiny prizes from us! What is it? : Not sure what to read next? Well, we can help you with that! We recommend going on our blind speed date! But our speed date has a catch: your topic of discussion will centre around your favourite book or have your “date” recommend you a book. You’ll meet several people, and you’ll talk about books–what a life! Whether you and an individual end up together is beyond us, but you just might have a new book on your list. Sign up here to join this activity! What is it? : How would the lyrics of modern day poet Nicki Minaj sounds like if we put some flair in the reading of her words? We bring several people to read texts of their choice and to read them dramatically in this session of complete silliness. This entry was posted in Announcements, Bookswaps on November 18, 2015 by teah. Our AMAZING READING RACE went along just swimmingly last Sunday! Thanks to teams for your patience and enthusiasm throughout the drop-in races. Check out our photos and updates on our Instagram and Facebook. We’re pleased to announce the TOP 5 TEAMS who will be competing in the Final this Sunday! Up to $1,000 worth of prizes up for grabs in the final race from Baiduri Finance, Thebooktiquebn, Erosphilia, Enya Bijoux, FHZ Couture, Heartbead, Hs_colormadness, Tiqs Homemade Sushi, neonttwist, Nollybook, Rajka’s Kitchen and more! 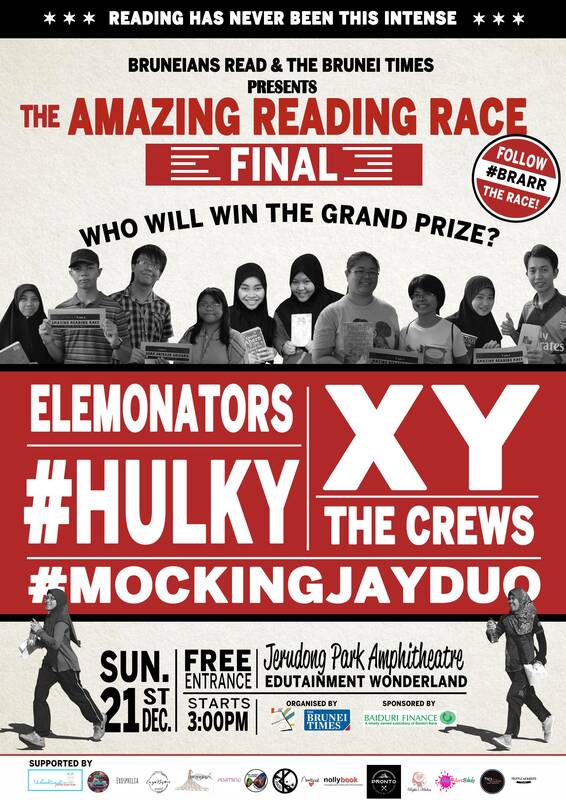 This entry was posted in Amazing Reading Race, Announcements on December 19, 2014 by hazirah. We’re pleased to announce the return of our bookswap on the 2nd November 2014 at Mabohai Shopping Complex. That’s only a week away! You can keep updated with us on our social media (especially our Facebook and Instagram) for more announcements! Mabohai Shopping Complex will also be holding other reading-related activities on the same weekend, so do visit Mabohai’s Facebook for more information. This entry was posted in Announcements, Bookswaps on October 26, 2014 by hazirah.